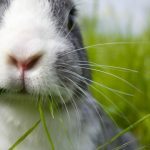 Home » Rodents » rabbits » What Fruits and Vegetables Can Rabbits Eat? Apart from a constant supply of hay, fresh vegetables and fruits are also important parts of your bunny’s healthy diet. Fruits and vegetables provide additional nutrients, vitamins, and minerals as well as different food textures and tastes. What fruits and vegetables can rabbits eat exactly? Fresh foods also provide additional moisture in the diet, which is good for kidney and bladder function. The majority of fresh foods should be made up of leafy greens, about 75% of the fresh part of the diet. As a rule of thumb, you should feed your bunny about 1 cup of greens for 2 lbs of rabbit body weight once a day or you can divide this amount into multiple portions a day. 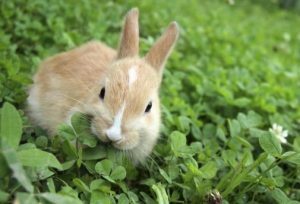 Any leafy green that is safe for a human to eat is safe for a rabbit to consume, but there are exceptions in terms of nutritive and health benefits. What fruits and vegetables can rabbits eat to stay healthy and happy? Apart from a cozy home, rabbits need a healthy diet to keep them playful and happy pets. This includes hay, bunny food in pellets, fruits and veggies. Let’s start with the concerns first. Many plants contain naturally occurring chemicals called alkaloids. These are mild toxins that protect plants in the wild. The chemical most talked about as regards rabbits’ diet is oxalic acid which is harmless to bunnies when consumed in small amounts. The amount of oxalic acid within each plant varies significantly due to several factors including the composition of the soil the plant grew in, the time of year and the age of the plant. Most of the fresh vegetables you feed your rabbit have a low to zero level of oxalic acid, but a few, most notably parsley, mustard greens, and spinach have relatively high levels. So, can rabbits eat spinach? Yes, but in smaller amounts than other leafy vegetables. The toxicity of oxalic acid comes into play with feeding too large quantities of foods high in this chemical. This can result in tingling of the skin and the mouth, and damage to the kidneys over time. Foods containing oxalic acid are nutritious and do not need to be excluded from the rabbit diet if you feed them appropriately. 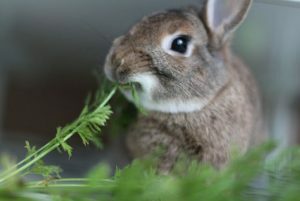 The general recommendation is to feed your bunny a minimum of at least 3 types of leafy greens a day, but only one of them should be from the group listed above. Don’t feed the same fruits and veggies all the time from week to week. Rotating the fresh greens will also give your bunny variety in taste, texture and general nutrition! Some rabbit owners are also concerned whether their rabbits will take the sufficient amount of vitamin A from greens. Since hay is rich in vitamin A, and hay will be available at all times, no need to worry about this! Kale, which is often discarded from rabbit diet as a high oxalate food is actually very low in oxalates and extremely rich in vitamin A as well as most of the leaf lettuces. Apart from leafy greens, you can feed your bunny other vegetables such as root vegetables or “flowers” including broccoli. However, broccoli is higher in starch and sugars and should be fed in lesser amounts than the leafy greens. A proper amount of nonleafy greens to feed your rabbit would be about 1 tablespoon per 2 lbs of body weight per day in one meal or divided into two or more. 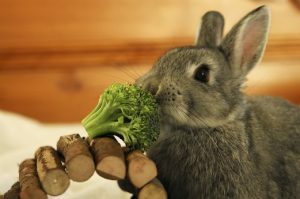 Some bunny owners are concerned about feeding foods that cause gastrointestinal (GI) gas in people such as broccoli and cabbage. A rabbit’s digestive tract is not the same as ours. Because of that, many of the foods that may cause gas in people do not cause gas in bunnies. One study done on rabbits showed that it would take several weeks of feeding only huge quantities of these foods to see any abnormalities in rabbits’ blood. Nobody feeds their bunny cabbage and broccoli only so there is no cause for concern in feeding these nutritious foods. Do rabbits eat carrots and are carrots bad for rabbits? Carrots are considered root vegetables. Pet rabbits would have a hard time digesting root vegetables because of the presence of complex carbohydrates and less cellulose. As lagomorphs, your rabbits should mostly eat quality hay and green leafy vegetables since these would not upset their digestive system’s homeostasis. Apart from runny stool which will make your bunny feel uncomfortable, carrots are said to be dangerous for rabbits’ internal organs health. There has been a debate whether you should feed carrots to your bunny. Some pet experts say that carrots can be offered in moderation while others advise that you leave them out because of their high sugar content. It is recommended that vegetables which are high in sugar should be fed only as a treat and not as a meal substitute. If you are really inclined towards feeding your pet rabbit carrots, give a small slice of it as a treat every other day. The general rule when introducing carrots or any vegetable in general to your pet rabbit is that these should be done only once they are 6 months old or older. For the first six months, feed your pet rabbits hay, pellets, and water only. Yes, rabbits enjoy celery as a treat. You must, however, be careful to add it to your rabbit’s diet very gradually. Feeding your rabbit too much celery all at once may lead to digestive problems, possibly diarrhea or even death. Celery contains vitamin C, B1, B2, and B6. It is also a good source of potassium, folic acid, calcium, and fiber. It also contains phytochemical compounds which are effective in cancer prevention, lowering blood pressure and helping with rabbit migraines. Remember to offer celery in moderation as it’s basically a treat. Feeding too much celery to your bunny may lead to digestive issues and other health problems. Can rabbits eat romaine lettuce? 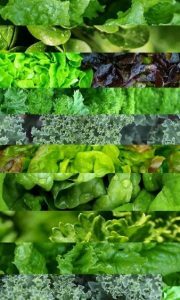 Romaine lettuce is darker and leafier and more fibrous variety of lettuce and you can feed it to your rabbit because Romaine lettuce is higher in fiber and actual nutrients than other varieties of lettuce. Introduce it gradually to avoid digestive problems. Bear in mind that large amounts of lettuce, for a rabbit unused to it, can cause digestive upsets. Strawberries are a good source of vitamin C and antioxidants. Bear in mind that rabbits can make vitamin C on their own, from their basic diet. 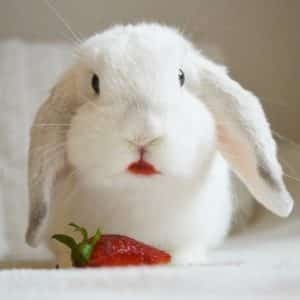 Strawberries are safe but feed them to your bunny in moderation and infrequently. Strawberries and other fruits (apples – no seeds or stems, blueberries, melon – no pits, oranges – including peel, blackberries, plums – no pits, pears – no seeds or stems, raspberries, peaches – no pits or pineapples) should all be treated as treats and offered after your bunny has taken enough hay and pellets. As for the fresh foods rich in vitamins, bear in mind that dark green leafy vegetables and red peppers have more vitamin C per weight than most fruits including citrus fruits. In general, fruits can be fed to rabbits in small amounts. Apart from providing additional vitamins, fruits make great training treats. You can hand-feed the fruit portion of the diet as part of developing a close bond with your bunny. 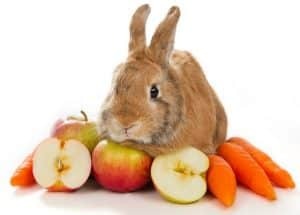 However, overfeeding fruits can result in a weight gain or GI upset so don’t forget to restrict the number of fruits as a part of a healthy rabbit diet. Once again, the approximate amount of fruit to feed your rabbit is a teaspoon per 2 lbs of body weight daily in one feeding or divided into multiple feedings. Before introducing any fresh foods to your bunny, you should do it after your fluffy friend has been eating grass hay for a minimum of 2 weeks. The grass hay will help to get his GI tract motility and flora in good working order so that he will be able to digest new foods more easily. 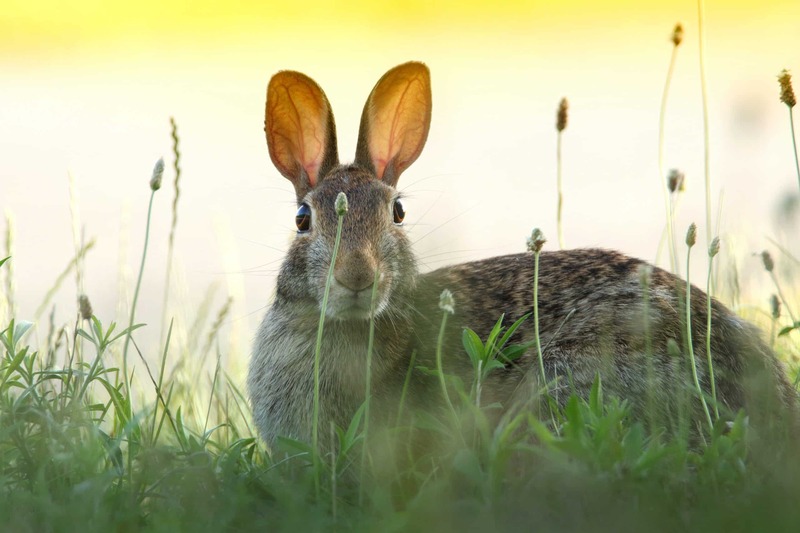 In addition, when introducing new fresh foods to any rabbit’s diet it is best to go slowly in order to allow the gastrointestinal tract and all its important microorganisms to adjust. It’s a good idea to introduce one new food every three days and keep a watch on their stools. 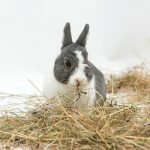 It is rare for a rabbit that has been on a hay diet first, to have any problems using this method, but if you note softer stools that continue over a couple of days, then you should remove that food from your bunny’s diet. You can keep a list as you go of the foods that your bunny has eaten with no digestive problems. This way you’ll know what they like and you can make those fruits and vegetables a part of your shopping list. Don't think about what fruits and vegetables can rabbits eat while putting on your seat belt on the way to the shops! These should make up about 75% of the fresh portion of your rabbit’s diet (about 1 packed cup per 2 lbs of body weight per day). These ought to make no more than about 15 % of the diet (About 1 tablespoon per 2 lbs of body weight per day). A healthy addition of fruits makes about 10% of the diet (about 1 teaspoon per 2 lbs of body weight per day). 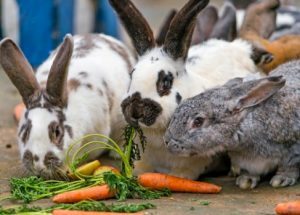 As you can see, what fruits and vegetables can rabbits eat is not a difficult question to answer if you know where to look and what to look for when it comes to keeping your bunny healthy through a healthy fresh dietary additions.